This is a church known to date largely from to c. 1420, for in 1423, Lady Elizabeth de Botreaux applied for a licence to make collegiate the church at North Cadbury "per ibsam de novo edificata et constructa". 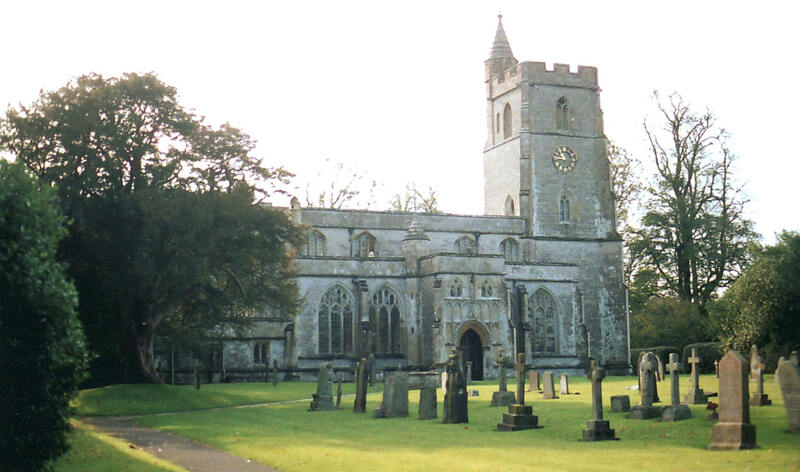 The tower was not replaced and dates from the fourteenth century, but to Lady Elizabeth's beneficence are due the nave and the chancel - built almost as one, with five bays to the former and three to the latter - and the two-storeyed porches which adjoin the central nave bays. These parts of the building may serve, therefore, as an example of the Perpendicular style in south Somerset before the great fifteenth/ early sixteenth century wave of church rebuilding got fully under way in the county, from about 1440 onwards. To consider the W. tower first, however, the date of which is hard to specify precisely, this rises in three stages to battlements, supported by diagonal buttresses with many closely-spaced set-offs, and is distinguished by a rood stair turret at the southeast corner, which turns octagonal at the bell-stage and rises higher than the tower itself, to be capped, above battlements, by a ridged pyramidal roof. This is also the design (albeit without the battlements) adopted for the E. stair turrets to the porches (as illustrated in the photograph, left, showing the church from the southeast), indicating either that the upper part of the tower turret is a later addition, which it does not appear to be, or else that the mason responsible for the porches, copied this feature from the tower in order to give the church stylistic unity, which, if this was the case, would have represented a very unusual degree of artistic sensitivity at such a date. The three-light W. window to the tower has a transom at the springing, subarcuated outer lights, strong mullions, and a central light with a latticed supertransom above. The W. doorway is four-centred. The internal arch to the nave has just simple semicircular shafts attached to the responds. Except in the porches, the chancel E. wall and clerestory, all windows to the early fifteenth century parts of the building are three-light and supermullioned (although the chancel windows are larger), and both the lights and the sublights are everywhere cinquefoil-cusped. 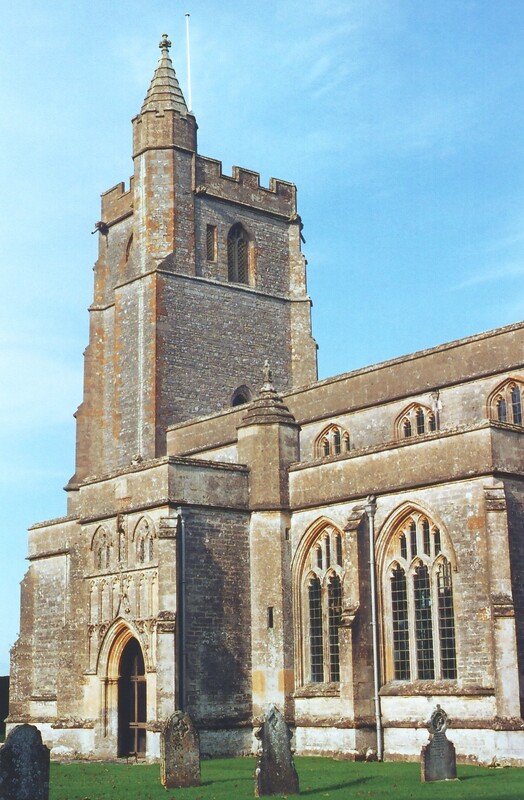 The cinquefoil-cusping of sublights (as opposed to trefoil-cusping) is almost always a sign of prestigious work before c. 1460 and can be seen also, for example, at St. John's, Yeovil, in this county (built c. 1380 under the direction of the great William Wynford, master mason of Winchester Cathedral when the nave there was designed and built), and at St. Edmund's, Southwold (between c. 1399 - 1413), and St. Mary's, Bury St. Edmunds (between c. 1424-33), both in Suffolk. As for the use of supermullioned tracery here, that was unusual across much of southwest England from the outset of Perpendicular times, with alternate tracery - as seen at St. John's, Yeovil - being preferred instead, and Kenneth Wickham's attempt to explain the use of supermullioned tracery (in his book Churches of Somerset, Phoenix House Ltd., 1952) as precursory to the later development of the more typical Somerset style, does not fit the facts of the case: rather, it seems more likely to suggest the master mason was not a local man. 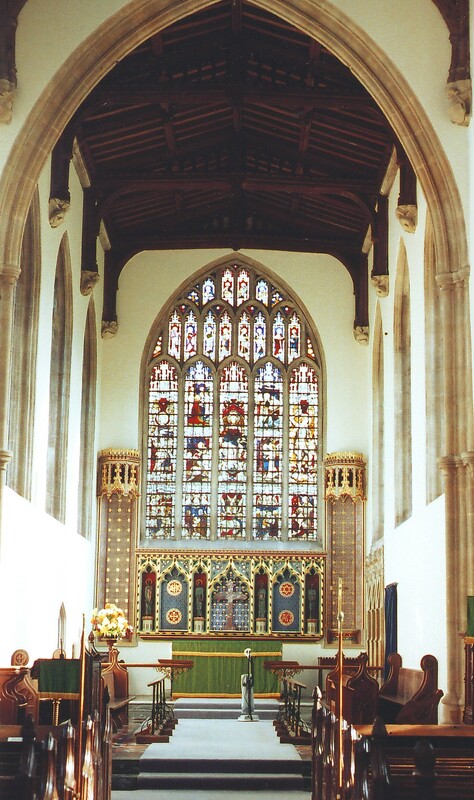 The five-light E. window to the chancel (shown in the internal photograph, above right), however, is almost an amalgam of the two styles, for while the mullions between the main lights here do continue to the window head (save for a split "Y" at the top of the lower tier of sublights), they are nevertheless reduced in section, leaving the thicker supermullions rising from the apices of the lights below, to provide the main vertical emphasis. The clerestory windows are four-centred and untraceried, as necessitated by the shorter vertical space available for them, and the two, two-light windows in the upper storey of the diagonally-buttressed porches (as can be seen in the photograph of the N. porch, left, and of the S. porch, top left) have simple reticulated tracery, leaving the crocketed ogee-arched outer doorways, the blank cinquefoil-cusped arches above and to either side, and the niches for statues between the windows, to create the distinctly grand impression that these porches present. 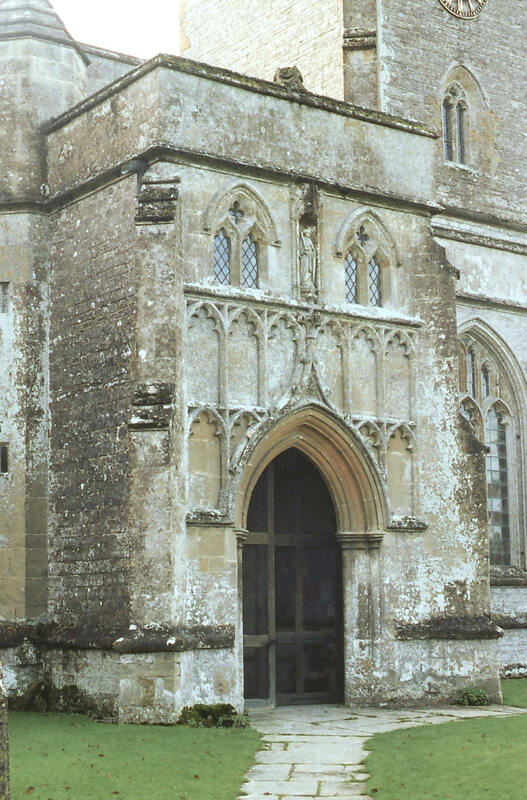 The porches, like the nave and chancel, are also very tall and topped with a plain parapet, which is austere but imposing, and the porches are decorated internally with dissimilar lierne vaults. A similar impression is created inside the body of the church where, except to the east, the building benefits greatly from being glazed with clear glass. The nave arcades are also tall and formed of piers composed of four major and four minor shafts with capitals going round the whole cluster, and arches above bearing three sunk quadrant mouldings. (See the S. arcade, right, viewed from the east.) The chancel arch is similar, but so high that it receives two sets of capitals, one at the same height as the capitals of the nave arcades and another further up. The triple sedilia recessed in the S. wall of the chancel has been renewed but is very attractive nonetheless. The font is simple and octagonal, with quatrefoils decorating the faces of the bowl. 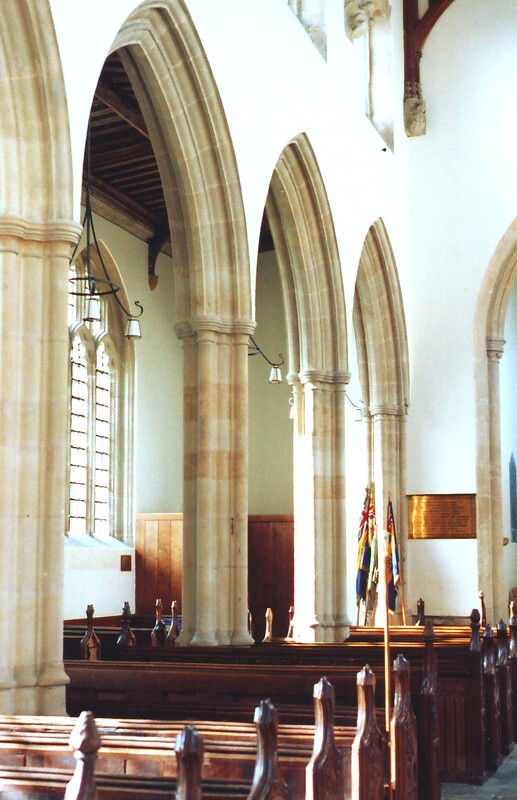 The attractive nave roof (shown below left, viewed from the west), which is presumably contemporary with the clerestory, is of a type rather better seen at nearby Queen Camel, though the work there is probably seventy or eighty years later. 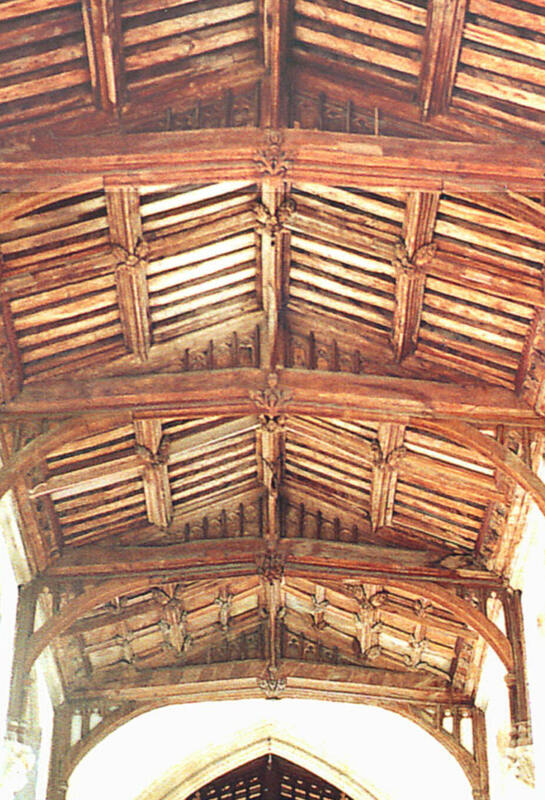 The nave roof at North Cadbury is low-pitched with king posts rising from cambered tie beams, spandrels above filled with eight openwork trefoil-cusped arches, and carved floral bosses decorating the intersections of the intermediate principal rafters with the halfway purlin and the beam at the ridge. The bench ends appear to postdate the roof by over a century, to judge from one, dated "1538": They feature a number of rustic scenes, including a man following a horse, a pier, and a cross-looking woman carrying a child (illustrated from left to right, below right). The church has no rood screen.